On the heels of the 10th anniversary of his historic Oscar win for best actor in Training Day, in which he played a criminal cop, Denzel Washington reminds us with his newest film, Safe House, why he's such a brilliant bad guy. "Sometimes when you're the good guy, you're sort of trapped," Washington said at a press conference. "Bad guys do have more fun." Washington, who also executive-produced the film, plays the flagrant Tobin Frost, a mastermind former CIA operative who traded in loyalty for cash, selling U.S. intelligence to the highest-bidding nations. Frost is on the run for some time before he's forced to turn himself in to the U.S. Embassy in Cape Town, South Africa. He's then taken to the local agency safe house, where the eager CIA rookie Matt Weston (Ryan Reynolds) is charged with not letting Frost out of his sight. Of course the drama, action and suspense ensue from there. Throughout the film, Washington as Frost is formidable yet lovable, an intersection where the actor seems most at home. True, he's a cold-blooded killer, but he never transitions into a full-fledged villain, leaving the audience to assume that his heart is pure and his motives for going rogue are justified. In preparation for his role, Washington ditched studying up on typical bad-guy conduct, choosing instead to understand sociopathic behavior in hopes of channeling his inner crazy person. "There's a book called The Sociopath Next Door, and I thought most sociopaths were violent, when in fact they aren't. But almost all sociopaths want to win, no matter what," Washington said. "As we were shooting, I had to find a way to win every situation, no matter what." Playing Frost was both familiar and unchartered territory for Washington, who experienced quite a few firsts during filming. He performed his own stunts and spoke candidly of a scene where he was waterboarded. "I wanted to see what it would be like. It's strange. You can't breathe in because the water comes in, and it's filling up your mouth," Washington told the press. "And that was just one time for a short time. Imagine having that done for 20, 30 seconds. You will give up the answers! You may not necessarily tell the truth, but you will tell [your captors] whatever they want to hear." Another first? Getting a black eye, thanks to his co-star. In one of several the-bad-guys-are-chasing-us shoot-outs, Weston is driving with Frost in the trunk of the car when Frost escapes into the backseat. "I reach over, we're flying around in the car, and just as I was reaching forward, he was flying back," Washington said. "And then, pow! He gave me a black eye." Reynolds, fearful that he had angered an actor he greatly admires, calling Washington the best working actor in Hollywood, joked, "I practically had to wear an adult diaper before doing a fight scene with Denzel. I mean, I've seen Hurricane! And now I've given [Washington] a black eye! That was my early retirement." Washington did make observations at the press conference about postapartheid South Africa, where the film was shot. Having visited the country before — he and his wife renewed their wedding vows there in 1995 — he noticed that things were markedly different. "When we shot Cry Freedom, I wasn't even allowed in South Africa. They told me I could come but I wasn't going to leave. I had a lot death threats at that time," Washington said. Now, he says, "Cape Town is Santa Monica on steroids. It's one of the most beautiful towns you've ever seen." 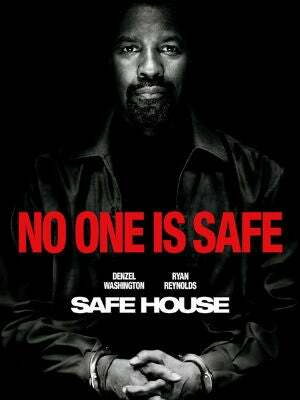 Despite all the violence, shooting and injury, Safe House grapples with serious questions concerning government secrecy, prodding viewers to think about whether or not conspiracies are more than just theories, an idea that has become more salient in a post-WikiLeaks world. Did the film challenge Washington's own perceptions of government corruption? Not really, says the actor. "Years ago, even prior to 9/11, I did a movie called The Siege. I did a lot of research with the FBI and the CIA, and I was amazed at that time … how little information they shared with each other. So after that, I'm not surprised by anything," Washington said. Akoto Ofori-Atta is The Root's assistant editor. Follow her on Twitter.